Calling on All Ecopreneurs to Apply for the Climate Champion Award - GreenBuzz Berlin e.V. 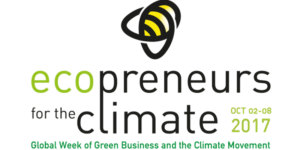 GreenBuzz Berlin, together with its partners, are delighted to announce that they have the honour if organising the upcoming Ecopreneurs for the Climate (#ECO4CLIM17) event occurring in Berlin on Tuesday 5 October 2017. It forms part of the ‘Global Week of Green Business and the Climate Movement’ and will bring together entrepreneurs with a passion for solving climate change related issues from all over the world. The events themselves, across the different cities consist of expert panel discussions, awareness raising and other climate change related activities involving passionate individuals and small and medium enterprises (SMEs). The panel will focus on the question ‘How can small companies or projects tackle big climate problems?’, a highly critical topic when trying to make climate protection happen through a bottom-up approach. In addition to this, leading ecopreneurs will have the opportunity to participate in the Climate Champion Awards where they will be given an opportunity to present and pitch their ideas in front of a judging panel. One global winner has the chance to participate in and present themselves at the upcoming COP23 negotiations. One area in which participating ecopreneurs could be encouraged to design and showcase their solutions is in the field of climate change and health. Solutions presented could potentially do some or all of the following. They might create tools that empower the public to take action by providing information about climate change’s health impacts or the health benefits of actions taken to reduce greenhouse gases. They might help health and other professionals by showcasing support tools that they can use to fight climate change and better promote their work. They might empower academic institutions, policy makers and other researchers to analyse climate change and health data in more innovative ways in order to move research forward in key areas. They might challenge and encourage private sector organisations to use their own climate change and health data with their own data in order to develop innovative decision support tools or address important research questions. Or they might design a completely new solution. Ecopreneurs, who are interested in helping solve climate change and health issues, might be inspired by the community-based organisation Coalition for a Safe Environment (CFASE) in the United States. According to the Center for Climate Change & Health, “CFASE works to mitigate and eliminate public exposure and public health impacts caused by air, land and water pollution generated by the ports, international cargo [and] cruise ships, the petroleum industry, energy sources and the goods movement industry.” It is considered innovative, not only because it partners with “Universities that can provide research to build the evidence about the area’s toxic exposures and their impact on health” but also because it has established an online community complaint lodging and tracking system. Furthermore, it is a locally founded, bottom-up grassroots movement established in response to a locally identified climate change challenge. Apply as Climate Champion until September 22nd here. Registration as participant for the #ECO4CLIM17 Climate Champion Award event is now open and is free but must be done online prior to the event. Looking forward to see you! This article was written by Ken Fullerton. Ken Fullerton is an independent sustainable development consultant. He has worked on development related projects in Germany, Senegal, South Africa, Tanzania and Uganda and is passionate about increasing access to renewable energy across Africa. Between May 2011 and September 2015 Kenneth worked for Positive Planet, a French based international non-profit organisation, whose mission it “is to help men and women across the world create the conditions for a better life for future generations.” He holds a Bachelor of Arts degree in History from the University of Otago, New Zealand, a Master of Arts degree in Development Studies from the University of New South Wales, Australia and a Master of Public Management (MPM) degree from the University of Potsdam, Germany. He is a dual Australian and South African citizen. Sustainability: why should business care? Subscribe to our blog posts. Stay up to date on our events. Copyright © 2019 GreenBuzz Berlin e.V.